Last night was a take-3-Tylenol-PMs kind of night where I could barely get to sleep. So even though I was finally able to get some shut-eye (with the help of Tylenol PM) this morning was a puff fest for my eyes. Sometimes, all the concealers and makeup in the world aren’t exactly what you want to be slathering on your under-eyes, especially when your eyes are tired and irritated. What Causes Under-Eye Bags + DARK CIRCLES? I don’t mean to say that we should fear ageing or that the older you are, the more you should accept that under eye bags are inevitable—because if none of us aged, the world would be a very immature place. But, ageing is a huge factor in the elasticity of skin and its ability to bounce back. With age, the supportive muscle tissue keeping skin pliable and in tact weakens and makes it easier for bags and dark circles to form around your eyes. That’s why it’s important to take care of your skin early on, so neglect doesn’t catch up with you later! Not getting enough sleep might be the widest known cause of under eye bags, and is most likely the reason why people need their ‘beauty sleep.’ The MVP of your makeup collection when it comes to concealing under eye bags is not highlighter, foundation or even concealer. It’s simply a good night’s sleep! There are 3 major bad habits that can damage the health and elasticity of your under-eye facial skin area. That is, (1) smoking, (2) over-indulging in salty foods, and (3) causing eye strain from staring at the TV, phone, or computer screen too long (guilty as charged). Smoke is an irritant for eyes, so prolonged and repetitive exposure will darken already dark circles and further weaken the tissues making up your facial skin. Eating excessively salty foods causes fluid build up and retention in your under-eye area, making it puffy and swollen. Eye strain tires out your eyes even further, so do your facial skin and under-eyes a solid and take breaks during commercials and whenever binge-watching your favorite Netflix shows. It can sometimes be the case that baggy eyes and dark circles are embedded in your DNA. If mom or dad always had baggy eyes and dark circles, there’s a greater chance you will, too. But not all is doomed, because nurture is just as important as nature when it comes to the health of your skin. You’ve probably already heard, your skin is your body’s largest organ—which is why it’s so important to take good care of it! Maintaining a hydrating facial skin care regimen will have a huge impact down the line, especially if any of the above factors are also affecting your skin. If you’re the kind of person who looks at people funny when they apply under eye cream or face lotion, or you don’t think it’s worth all the effort, then beware…the lack of a regular skincare routine could be costing you dark circles and under eye bags! The key to getting rid of saggy under-eyes and dark circles is probably sitting in your kitchen. Potatoes are good for more than french fries (and french fries are pretty damn good). Potatoes are one of your kitchen’s best weapons in the fight against dark circles and under-eye bags. Placing thinly sliced potatoes on each eye and letting them rest for 20 minutes can work wonders on tired, sagging under eye skin. Potatoes have the ability to stay cold for a long period of time and their coolness is the most important part of reducing swelling and inflammation. Potatoes are able to deposit vitamin C, vitamin A and starches to the delicate skin around your eyes, waking up and reviving your skin to plump up any sagging. Potatoes are especially useful for brightening and lightening dark spots and dark circles around your eyes. Potatoes are a natural source of the enzyme catecholase, which is a known lightening and brightening agent found in fruits and veggies so you can gently lift dark spots and smooth out discoloration. Vitamins and enzymes naturally occurring in potatoes help refuel, nourish and moisturize under eye skin. Next time you have mashed potatoes featured in your dinner plans, save a potato slice for your eyes! Green tea carries an abundance of nourishing properties for skin. Cold, gently steeped green tea bags work as nutrient-packed cold compresses for tired eyes and baggy under-eyes. Antioxidant-rich green tea can help reduce darkness, swelling, and redness and can help reduce eye irritation, help get rid of styes, and even help combat pink eye/conjunctivitis. The caffeine content of green tea helps tighten and firm sagging skin and reduce the appearance of blood vessels. What sets green tea apart from some of the other under-eye savers you may find in your kitchen is its high concentration of flavonoids and tannins. Flavonoids are plant pigments that are also a great source of toxin-fighting antioxidants. Tannins are what give tea is flavor and color profiles, but are also good for stimulating healthy blood flow and circulation and for tightening and firming the delicate skin around your eyes. The only caveat with using green tea is that you have to be VERY CAREFUL that you’re using only organic green tea that is packaged in unbleached steeping bags so that you’re not exposing your eyes to potentially hazardous chemicals, toxins, irritants, and worse. It’s also important that after steeping the tea bags, you allow for the bags to completely cool and get cold in the fridge because the cold is very important for reducing swelling and redness. This is probably the classic you’ve been waiting for. What you’ve heard about cucumbers being angelic for tired, swollen and irritated eyes is true! In reality, cucumbers are about 95% water, but that other 5% is packed with natural nourishing and healing properties that can improve the appearance of dark circles and the health of under-eye skin. Cucumbers have been found to soothe skin and reduce swelling with their cooling properties. Their high vitamin C content can also help stimulate and improve skin cell growth around your eyes and promote skin cell renewal to fight wrinkles and improve elasticity. Cucumbers are rich in folic acid, a source of antioxidants that fight toxins. 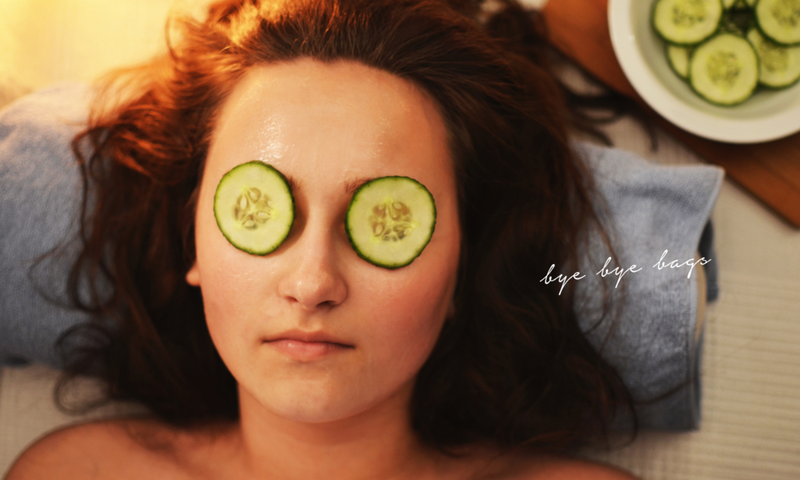 Placing cool cucumber slices on your eyes and allowing them to sit for around 20 minutes is basically like giving your dark under-eye circles an ice pack (95% water) with a bonus boost of potent nutrients (the bonus 5% nutrients). Avoid any allergens you may have and/or potential allergens you may not know you have! The best way to find out everything you’re allergic to is to get tested by your doctor. No matter how late you come back from the rager, always remember to remove your makeup and wash your face at night. Even if you’re wearing the latest ‘no smear’ mascara, it’s no match for sleep and pillow cases which can cause makeup bits to end up in your eyes and wreak havoc. This is weird, amiright? But your sleeping-on-your-stomach-without-a-pillow habit could be causing you your under-eye bags and dark circles. Elevating your head at night even slightly with a pillow can help prevent fluid build up in your eyes, which reduces your chances of getting puffy, swollen eyes in the morning. Try to avoid eating salty foods close to bed time (or as often as possible) since salt-heavy foods are often the culprit for fluid retention, inflammation, and swelling. This can be a challenge when you’re tossing and turning and stirring in your thoughts unable to fall asleep. But lack of sleep takes a ginormous toll on your eyes and under-eye area. Try taking melatonin supplements, sipping a relaxing cup of chamomile tea, reading a chapter of your most boring textbook from last semester, or whatever it takes to fall deep, deep asleep. Looking for a natural eye-makeup remover to kick under-eye bags to the curb? Let me introduce you. Our (Spin)Fuse Coconut Oil is infused with cold-pressed virgin spinach seed oil for a natural boost of B-vitamins, biotin and minerals important for healthy skin. No matter your age or skin type, your skin will benefit from the endless uses of (Spin)Fuse Coconut Oil. But most importantly, you’ll never again have to sleep with traces of mascara or eyeliner in your eyes. (Spin)Fuse is gentle makeup remover for stubborn eye makeup, lipstick and concealer and provides intensive hydration that penetrates the delicate skin around your eyes without irritation.